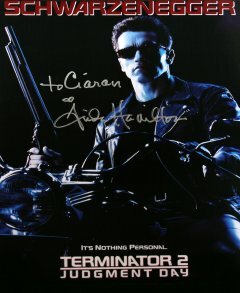 I really enjoy the Terminator films so it was a great thrill to meet Linda Hamilton at London EXPO in May 2009. She signed three prints and a poster for me, and she gave me a big hug when I had my photo taken with her! Linda Carroll Hamilton was born in Salisbury, Maryland, in September 1956. She has an identical twin sister, Leslie, an older sister and a younger brother. Linda's physician father was killled in a car accident when she was five. The twins went to Wicomico Junior High school, and Linda began acting with local children's theatre groups. she moved to New York City to study method acting at the Lee Strasberg Institute, where she had drama lessons with former director Nicholas Ray. This led to several small TV roles including the soap operas Secrets of Midland Heights (1980) and King's Crossing (1982). thriller Tag: The Assassination Game (1982). This was followed by the lead role of Vicky in the horror film Children of the Corn (1984). Linda Hamilton’s career really took off when she was cast in the role of Sarah Connor, who is pursued relentlessly by a killer android (played by Arnold Schwarzenegger) in the James Cameron directed film The Terminator (1984). Unexpectedly, the film proved to be a great commercial success, and Hollywood was so taken by her performance that she was cast as the same character in the sequel Terminator 2: Judgment Day (1991). Linda's twin sister Leslie was her double in this film, and is seen in the mirror during the CPU reprogramming scene, and also with Linda's son Dalton when Sarah is remembering playing with John at the park. Sarah Connor in Terminator 3: Rise of the Machines (2003). In between the two Terminator films, Linda played the role of Catherine Chandler in 46 episodes of the TV version of Beauty and the Beast (1987-90) opposite Ron Perlman, Nina in Black Moon Rising (1986) and Ellen Burrows in the romantic comedy Mr Destiny (1990) with James Belushi and Michael Caine. 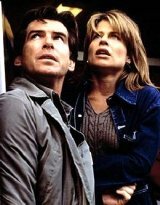 She then went on to star in Separate Lives (1995) with James Belushi; Shadow Conspiracy (1997) with Charlie Sheen, and Dante’s Peak (1997) with Pierce Brosnan, a film that was to prove to be one of the biggest commercial hits of that year. budget comedy set in Ireland (but filmed in Devon). Linda Hamilton married her first husband, actor Bruce Abbott, in 1982 but was divorced in 1989 after the couple had a son, Dalton (seen briefly as the baby John Connor in Terminator 2: Judgement Day (1991). Josephine (b.1993). They went on to marry in 1997, but then divorced in 1999, after Linda discovered that Cameron was having an affair with actress Suzy Amis whilst he was working on the film Titanic. on The Larry King Show and revealed that she had suffered from bipolar disorder for most of her life. She sought treatment for this during the 1990s.